In 1919 the first Dáil sent a delegation to Paris to lobby the post-WW1 peace conference to recognize Irish independence, and in later life one of its members set down his recollections. DIFP often makes extensive use of UCD Archives, which retains the personal papers of many of the key politicians and diplomats involved in shaping in independent Ireland’s foreign policy. These personal collections often contain photographs, manuscripts and personal effects that would not normally be published in a DIFP volume. A notable case in point is the extensive archive of the journalist and diplomat Michael MacWhite (1883-1958). MacWhite was from Glandore in Co. Cork. Having become involved in Sinn Féin, he later became a journalist on the continent, reporting from as far afield as the Balkans and the Middle East. 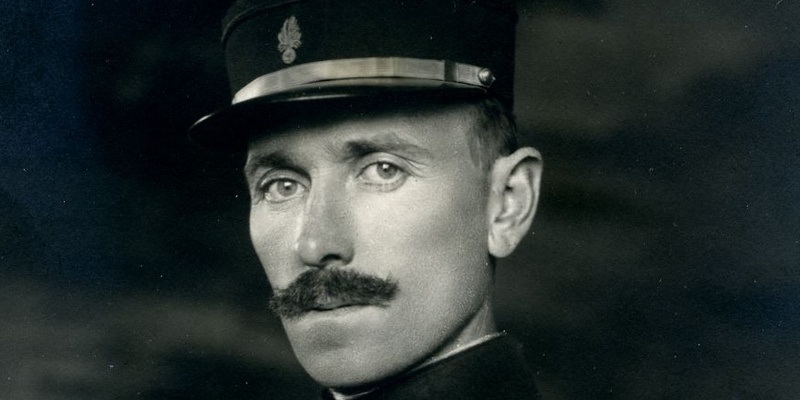 He joined the French Foreign Legion in 1913 and saw service during the First World War, including at Gallipoli and in Macedonia; he was wounded twice and won the Cross de Guerre three times, rising to the rank of captain. He later enjoyed a lengthy and distinguished career in the Department of External Affairs, serving as the Irish Free State’s representative to the League of Nations (1923-29) playing a key role in Ireland’s admission to the organisation), and subsequently as Irish minister (effectively the ambassador) to the US (1929-38) and Italy (1938-50). In the late 1940s and early 1950s he seems to have begun to write his memoirs. Numerous drafts of memoirs survive, relating to all aspects of an undoubtedly colourful career, but of particular interest, given the ongoing centenaries of the Irish revolution, are those that relate to his time in France as a member of what was, to all intents and purposes, Ireland’s first diplomatic mission, in 1919-21. The handwritten drafts of MacWhite’s memoirs of France form part of his papers in UCD Archives (P.194/673-80). He had been in New York for the Armistice of 1918 as part of the French military mission supporting the ‘Liberty Loan’ (the bond drive organised by the US government to raise fund for the Allies) before returning to France, thence to Dublin on leave. MacWhite was subsequently asked to bring copies of the First Dáil’s Declaration of Independence, Democratic Programme and ‘Message to the free nations of the world back to France, and to attempt to get them published in various newspapers to publicise the cause of Irish independence. MacWhite returned to Paris on 22 January 1919, and from then on was essentially a Sinn Féin emissary in the French capital and had the task of garnering publicity for the Irish cause. He was the correspondent for the newspaper United Irishman, and described his involvement in the production of a French edition of the Dáil’s propaganda organ, the Irish bulletin. MacWhite’s memoirs of his time in Paris provide a level of texture and detail on the activities and workings of the Irish mission in Paris and include his recollections of addressing a wide range of audiences (including the Grand Orient de France, an enormously prestigious – and, it was assumed, influential – Masonic Lodge), and of his various activities (including an audacious attempt to gatecrash a commemoration in Versaille marked the birth of Lazare Hoche, the French revolutionary general who had commanded the abortive invasion fleet that was supposed to land in Bantry Bay in 1796 in support of the United Irishmen. The Michael MacWhite papers can be viewed subject to permission; applications to access them should be made in writing to UCD Archives. The full version of this article can be read in the current (Jan.-Feb. 2019) issue of History Ireland. Image courtesy of UCD Archives.